The University of Miami Miller School of Medicine’s Infectious Disease Research Unit at UM/Jackson Memorial Hospital CRS has been recognized for its outstanding performance as a clinical research site in the Randomized Trial to Prevent Vascular Events in HIV (REPRIEVE). Led by Dushyantha T. Jayaweera, M.D., professor of medicine and senior associate dean for research at the Miller School, the team was singled out by REPRIEVE leadership for seamlessly handling the transfer of 26 participants when a neighboring clinical research site closed. 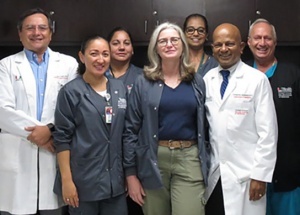 From left: Jose Castro, M.D., Sendy Puerto, Annie Salvarrey, Lisa Rohn, Vivian Pastrana, Dushyantha T. Jayaweera, M.D., and Tom Tanner. REPRIEVE is the first large-scale randomized clinical research trial to test a strategy for heart disease prevention among people living with HIV. Specifically, REPRIEVE will explore whether a daily dose of a statin (pitavastatin) reduces the risk of heart disease among HIV-infected individuals. Although AIDS-related complications and deaths are declining, heart disease among HIV-infected individuals is emerging as a major public health problem. This is happening despite effective treatment for HIV. People living with HIV are 50 to 100 percent more likely to develop heart disease — including heart attack and stroke — compared with people who do not have HIV. Increased chronic inflammation related to HIV may be contributing to the increased risk of heart disease. Other team members from the Miller School include Jose Castro, M.D., Sendy Puerto, Annie Salvarrey, Lisa Rohn, Vivian Pastrana, and Tom Tanner.